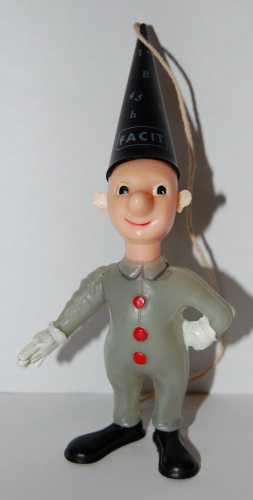 The "Facit man" is an advertising figure developed by the adding machine manufacturer Facit of Sweden. He was first used in manuals and advertising in the 1950's with plastic figures created in a few different designs for shop display and to give to customers. Made in Sweden, 110mm tall 1960's Facitman "Yellow"
Made in Hong Kong, 95mm tall 1960's Facitman "Orange"
Made in Hong Kong, 95mm tall 1970's Facitman "Grey"